Have I ever shown you these pictures? I came across them today when I was looking for some other pictures and I've decided that I'm going to frame them and hang them somewhere before I lose them again. Someday my grandkids will come to visit and wonder why I have a couple of grainy, overexposed photographs that were clearly taken with a crappy disposable camera up on my wall where their pictures should be. They'll ask, "Grandma, who's that band? Were they your favourite or something?" And I'll say, "Those aren't pictures of a band; those are pictures of your grandpa and me. I'm on the top, he's the bottom one." They'll be confused by this and will probably try to pick me and Barclay out of the lineup on the stage. They'll point at the fiddle player, the only woman, and ask, "Is that you?" I'll say no, and that'll really throw them. They'll ask which one is Barclay, and I'll tell them that he's not up there either. So then they'll most likely start looking in the corners of the picture and under the stage, like it's a real-life Where's Waldo puzzle, but they won't find any people other than the ones on the stage holding instruments. So they'll look at me like I'm crazy (and maybe I will be by then; who knows? ), but I'll just smile and say, "We're the ones behind the cameras." 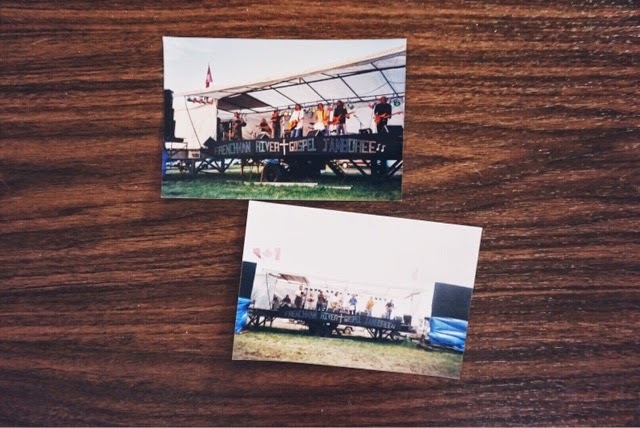 Growing up, my family went to a jamboree in the Frenchman River Valley every year (we literally did not miss a single year). Maybe that's where my intense love for live music was born. My mom was on the committee in charge of booking the artists and organizing the food and it was this weekend-long thing where people would come from all over to camp and sit outside listening to days of live music. I was from a really small town, technically a village, which was surrounded by a bunch of other really small towns, also technically villages. All the kids within a two hour radius knew each other from the jamboree and from the week-long camp which ran out of the same site just a couple of weeks afterward. It was the highlight of my year, every year. I had a bunch of really close friendships which only existed on phone lines except for those two weeks. Anyway, it was set up so that the acts during the day were geared towards the adults and at night there was a stage with the 'louder' music. For the crazy teenagers, obviously. That was how Barclay ended up at my jamboree one year, when I was 14 and he was 16. He had travelled down to my corner of the province in his junky old tour van with his buddies and was playing bass in one of the loud teenager bands. I was one of the loud teenagers in the front row screaming my face off, as all good loud teenagers should. At some point that weekend, we were both at the main stage at the same time and we both took a picture of the same band. Who could've known then that ten years later we'd be sitting in our living room together looking at each others' photo albums (look at your clothes! I didn't know you had a mohawk. Where was this taken? Who's that... Oh! It's you! ), and we'd come across our matching pictures and realize that if we'd just glanced over during the final chorus of No You No Me we'd have seen...each other. I've often wondered what would've happened if we'd met that weekend. If we'd looked over and noticed each other, if he'd come over to say hi and ask for my number the way he was going to the next time we saw each other. If we'd exchanged email addresses before he got back in his van and drove off, back to Regina where he'd stay until I moved there as an adult years later. Who knows? And, with the way things have turned out, who even cares? We clearly have a best-case scenario here. I wouldn't want to mess with that, especially knowing the success rate of high school romances. Besides, 14 year-old me was almost an entirely different person than the one he met and liked later on. Maybe I should be thankful that the little weirdo kept her eyes to herself and didn't ruin my entire future. But I still really love these pictures. They're very talkative. They say lots of things to me, like, "What if?" and "Isn't that funny?" and "Make sure you keep your eyes open." They remind me that Barclay existed in the world before he came into mine, they point out that we had a few things in common even when we were young and weird, and they yell back in time, unheeded, to a couple of completely oblivious teenagers, "Turn your head!"